We can’t hold a relationship down, because we don’t put much work into it. We want a microwave minute answer to relationships, which is a process that has been long in the making. Each one of us feel, express, demonstrate, relate, respond and we love based on our experiences stemming from birth, yet we want a minute rice recipe to understand each other. Our life long process and how we interact in a relationship cannot be answered in a microwave minute. In the interim, we are being socialized to be dumb. We are being socialized not to think. Consequently, we won’t read a book if it is too thick. We won’t read an article if it does not have a picture. This diminishes our ability to read information that is necessary to our well-being, existence and maybe even survival. Some of the most powerful books do not have pictures. If the secret to wealth was written in a book that is 5 inches deep, many of us wouldn’t know of it. The necessity of a picture in which to draw our attention is the same method writers used when we were children, and just learning to read. There were picturesque books our teachers and parents would buy in order to hold our attention. Have we regressed to childhood reading level? Consequently, we are non-thinkers. We want the best of everything in life, but are not working to get what we want. We don’t set goals, and we have no expectations to set a plan. No wonder we cannot maintain a relationship! Our behaviors are clear signs of our lackadaisical efforts. We simply take the easy way. It is easier to look at another person and lust for him/her, rather than look in the eyes of our partner to see the depths of his/her heart. It is easier for us to rant and rave, than it is for us to think and reason through a disagreement. It is easier to walk away from the one we love, rather than to stand to stay. It is easier to fake it, than to make it better. It is easier to wait for a job to fall in our laps, than to hustle to get our hustle on. To everything there is a solution. We just need to think! When we are dummied down, it puts the brain in a state of stagnation, but an answer is always in queue when we turn the brain on. When we react and respond without thinking, our brain is on pause. When we become easily flustered, angry or frustrated we are not using our brain. We are so becoming so mentally frail, that there is nothing left for us to do— but feel. That makes matters much worse. Feeling is the thing we mostly always do, and that doesn’t take any work at all. We become easily frazzled, and our interpersonal skills are weakened to the point where we cannot create a win-win for the problems in the relationship. Then we plummet into a state of helplessness where we don’t know what to do when we have problems in our lives. This is because we have not exercised our minds to create solutions. We don’t read enough so we have no data to begin formulating a plan for anything. When things don’t work in our favor, the feelings of pity become more pronounced. When we enter a relationship, we do it based on how we feel. It does not matter if those feelings make sense or not. Our feelings become so paramount where we think we are ready for Love without much consideration of reciprocity to love in return. We do not think enough to determine, if we really know how to Love or not. Interestingly enough, regardless of how emotional we are, it is not enough to keep us in Love. We fall out of Love so easily. Where did our feelings go? This is why we coined the saying, “I’m not feeling him anymore. I’m done.” or “I’m not feeling her anymore. I’m done.” Feelings are fleeting. Thought and logic continues to evolve. When Love comes, (and it does) we can only relate to that person emotionally. Our emotions fluctuate, and ride on tidal waves of heightened feelings. When the relationship problems begin, (and they do) the problems are so involved with the feelings of both partners that when those feelings clash, we cannot logically work it through. We are remiss of the many possibilities why we have relationship problems. This is in part, because we are getting together out of an emotional need. This prohibits us from knowing, and understanding the various nuances we own from person to person. The results of what we do, like cheating for example, is evident of a deeper problem. We cannot begin to understand the deeper problem, because we are so focused on how we feel about cheating. With everything spinning on “feeling” the experience of a relationship ending causes a deeper feeling of rejection. We become so easily broken. We continue on a path of emotional damage, because the lessons we refuse to learn. Never admitting we failed, because we were feeling all the time and not logically working through the relationship. Rather than taking ownership of our failures, we sit down and hurt instead. Our relationships would be stronger if we got in deep, stop being fearfully shallow, and look beyond the surface. If we have relational discussions, we should work to reason why we have opposing views on the subject, and in the end, find a way to conclude with a resolution. Our communications will become much stronger. If we studied our partner and thought about him/her in a thought provoking way, opposed to how they make us feel, we may learn something. If we took the time, and used our feelings in the capacity of being more empathetic, we can relate to each other better in our relationships. 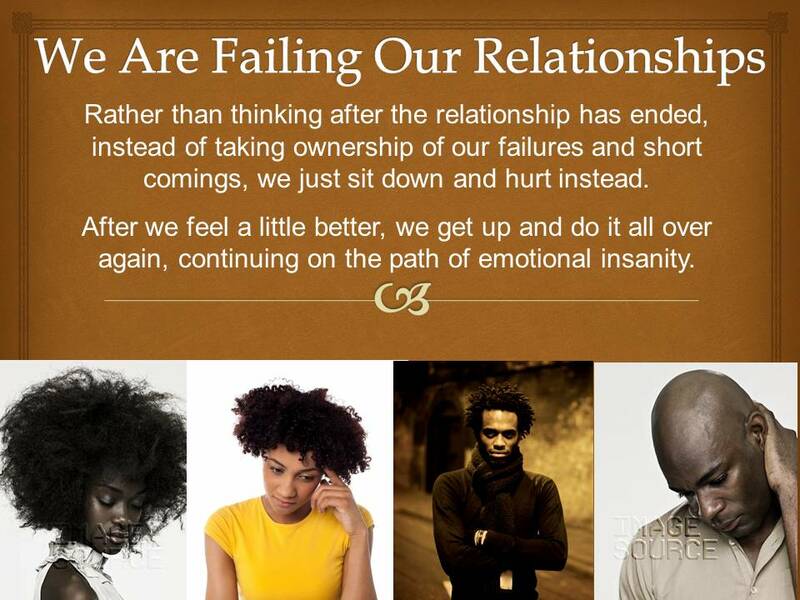 This entry was posted in Actions in Relationship and tagged failing in our relationships, in a relationship because of emotions, marrying because of an emotional need, taking responsibility for our failures. Bookmark the permalink. i think it isa brilliant idea. highly mmendable. count me in. sure love to join.